I am at the airport so this is a quick post with pics I took yesterday. I present to you my going on vacation mani. 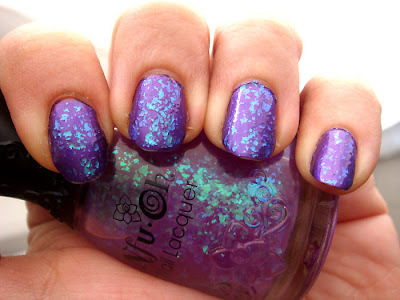 Two layers of Etude House Lucidarling in purple topped with two layers of NfuOh #50 and a coat of Etude House top coat. Let's see how long it is gonna last in travelling conditions while I carry my suitcases and everything. *sighs wistfully* I love this polish. I actually love ALL of the NfuOh flakies... One day, they will ALL be mine! It looks fantastic on you. Thanks for showing it! this is amazing! i would love to try a nfu oh flakie!! Wow that is such a cool colour! Have a good holiday!